It has been a long wait.In the 1st test, Rahul equalled Mark Waugh's record of 181 catches.Since then, Rahul didn't get any opportuinity to cross the mark.Even in the 3rd test, when 1st innings saw kiwis edging the ball behind on several occasions, most of those went to M.S.Dhoni. Finally, today, when McIntosh edged one to the 3rd slip where Rahul was standing.Rahul dived forward and low to take a smart catch. Congatulations Rahul.You really deserved it! “I am happy, very happy. In fact, last night he called and spoke about the 60 he scored and I then jokingly asked him, ‘so when are you finishing the catching business?’ I am delighted that he made it his own. 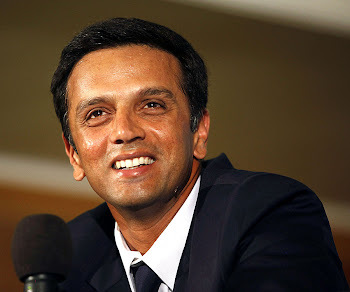 You truly are amzing Dravid and like santosh said, we all do miss u in ODI's.